Here’s the deal, I love berries – all sorts of berries. When I am not enjoying the Jersey Fresh strawberries we grow here on our farm, I turn to Driscoll’s Berries for the sweetest, freshest berries around. 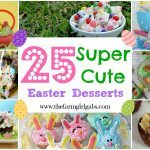 Spring is FINALLY here and I am ready for some lighter spring desserts. 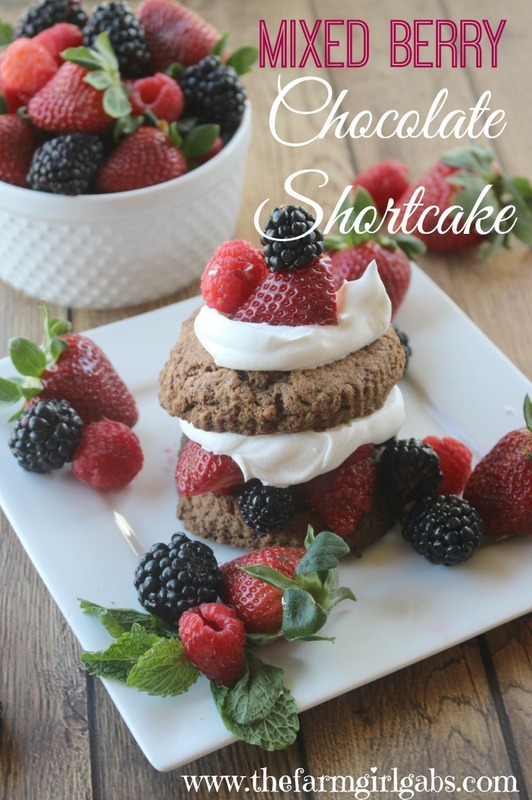 Mixed Berry Chocolate Shortcake is the perfect answer. I love strawberry shortcake. I thought it would be fun to change it up a little by making the traditional vanilla biscuit a semi-sweet chocolate biscuit. Chocolate lovers rejoice! This chocolate creation will be right up your alley! 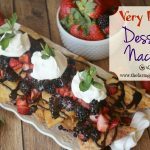 I also combined three of my favorite Driscoll’s Berries – strawberries, raspberries and blackberries together for the topping. Begin by mixing the dry ingredients together to form the base of the biscuit. Add the cubed butter and incorporate together until the dough forms small peas. Then, mix in the heavy cream and mix until a sticky dough forms. Turn the dough out onto a light floured surface. Roll out until dough is 3/4 inch thick. Using a biscuit cutter, cut 10 circles and place them on a lined baking sheet. If you don’t have a round biscuit cutter, you can use the rim of a large glass to cut the shortcakes. The shortcakes will rise nicely when baked. Allow to cool completely. While the shortcakes are cooling, I wash and cut up my berries. I just love their vibrant colors. I added a teaspoon of Grand Mariner to the berry mixture just to bring out their flavors a little more. You can leave this out if you don’t like it. To assemble, I top one shortcake with a generous helping of the mixed berries and whipped cream. I top it off with another shortcake handsome more whipped cream and berries. This is the perfect make-ahead dessert too. You can bake your shortcakes the night before and store them in a air-tight container or storage bag. Cut your fruit up the morning before you plan to serve and you have a delicious dessert in a jiffy! Cut up berries in medium bowl. Sprinkle with sugar and Grand Mariner. Refrigerate until ready to use. In another medium sized bowl, sift all dry ingredients together. Using a pastry blender, cut in butter and mix until small peas form. Add heavy cream a little at a time and mix until a sticky dough forms. Turn dough out onto a floured surface. Roll dough about 3/4 inch thick. Using a round biscuit cutter, cut out 10 shortcakes and place on a lined baking sheet. Bake at 425 degrees for 12-15 minutes. Remove from oven and cool completely. To assemble shortcakes, top one biscuit with a generous helping of the berries. Top with whipped cream. Add another biscuit on top and add another dollop of whipped cream and berries. A chocolate shortcake?! This looks divine, Melissa. I’d love to make this for a special weekend breakfast for the family. Ooh hoo – this looks divine! I love me some berry shortcakes – I make one with strawberry & rhubarb. Love the addition of chocolate to the cake part. Drooling, this looks so delicious! YES! This looks divine! Thanks for sharing this recipe. My whole family would love this! That looks AMAZING!!! Pinned it.